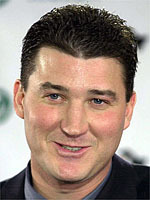 One of the greatest ice-hockey players of all time, Mario Lemieux led the Canadian charge for the gold medal at the 2002 Salt Lake Winter Games after bouncing back from cancer to re-launch his career. Fifty years after their last Olympic title, Lemieux and Canada won a thrilling gold-medal match with a 5-2 victory over the host Americans. As a youngster, Lemieux's father, a builder, constructed a makeshift ice rink in the back garden, much to the delight of his three enthusiastic sons. Mario was soon using his imposing frame and great speed to establish himself as one of the finest junior players in Quebec. According to the traditions of North American ice hockey Pittsburgh Penguins, having had a terrible season the year before, had first pick of all the new young players and immediately went for Lemieux. In 1988, he was top scorer ahead of the great Wayne Gretzky winning his first scoring title and National Hockey League "Most Valuable Player" award. Pittsburgh were turning into a dynasty with Lemieux and Czech star Jaromir Jagr fuelling the attack and the duo led the Penguins to consecutive Stanley Cups (NHL champions) in 1991 and 1992. Lemieux's greatest battle came in 1993 when he was diagnosed with Hodgkins disease, a form of cancer, but with the support of his family and future wife (with whom he now has four children), he recovered. The treatment was so successful he started playing again and immediately won yet another top scoring title. Early during the 1993/94 season he announced he was taking a year off mainly because of persistant back problems but on his return to the ice he picked up where he left off, winning two straight scoring titles. After announcing his retirement in 1997 he was promoted to the ice hockey hall of fame even before he was eligible for election. "The Magnificent One" has also opened up a foundation bearing his name to continue research in the battle against cancer. He became the majority owner of the Penguins in 1999, hauling them out of bankruptcy and his love for the game even dragged him out of retirement when he re-laced his skates in December, 2000. In 2004, he was again at the fore for Canada helping his country to the prestigious World Cup with an overtime win over the Czech Republic but on a down note, the NHL season was cancelled due to a labour dispute between owners and players. In December 2005, he was finally forced to retire for good with heart problems and missed out on Canada's Olympic campaign at Turin in 2006. He has also founded the Mario Lemieux foundation to fund medical research projects and in 2007 alongwith other athletes such as Muhammad Ali and Andre Agassi formed the charitable organisation, Athletes for Hope which promotes involvement from athletes and non-athletes to support the community.